The Altra Escalante 1.5 is one of Altra’s most popular shoes. The Escalante is a lightweight trainer or even racer. The midsole is responsive but cushioned and soft enough to do some mileage in it. 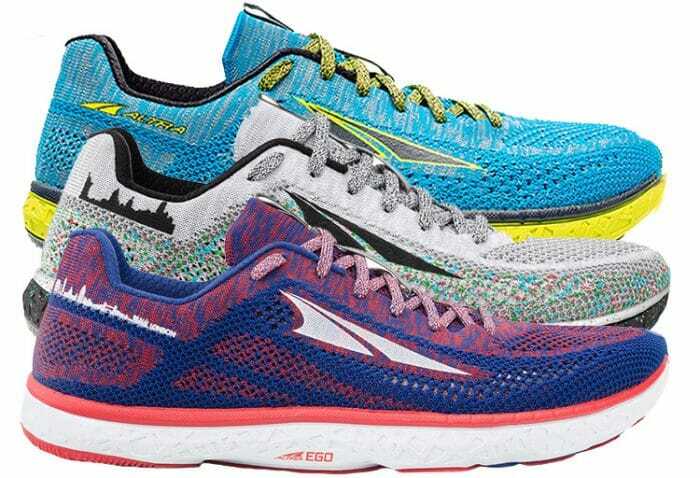 As the name might suggest the Altra Escalante Racer is the faster, lighter version of the Altra Escalante. As with all Altra shoes the Escalante Racer is Zero Drop. This is to encourage a more midfoot landing with the foot touching the floor under the runner’s centre of gravity. Customers used to a shoe with a high heel often say Altra shoes feel ‘fast’, simply by not having an elevated heel for you to crash into as you hit the floor. Naturally, that means the Altra Escalante Racer feels very fast! The midsole is not ‘hard’, just very firm and responsive. That means when your foot touches the floor there is nothing to slow you down. Your foot is allowed to instantly spring you into the next stride. However, unlike a lot of racers these shoes are very comfortable. There is still quite a bit of underfoot protection, so if you like firm feeling responsive shoes then you could use the Altra Escalante Racer for more than just race day or interval sessions. As well as the midsole, the other key difference to the Escalante Racer compared to the Escalante 1.5 is the upper. The Escalante 1.5 has a very soft knitted upper that has a bit of stretch. This is very comfortable but when going round corners particularly fast, could feel like you aren’t held into the shoe as well as you could be. As the Escalante Racer is made for ‘break neck speed’ the upper is made from a much rougher material with no stretch. The upper is still knitted so there are no seams to rub but you can corner at high speeds and the Escalante Racer remains glued to your foot. The only potential draw back is that the upper has a very open mesh, which although reduces weight, also allows the cold wind to pass through the shoes. So on a cold winters day you just need your warmest winter socks on. Obviously if we get the great summer we enjoyed last year then the super breathable upper will be a big advantage. When running in the Escalante Racer, as already mentioned, I found them to have a very fast feel. However, the cushioning is still good enough to run tempo runs in and not just intervals or races. You can see why Altra has named each colourway after a marathon, as these shoes would be a perfect shoe to help you beat your best marathon time. I can see why some customers who like firmer more responsive Zero Drop shoes have mentioned that they are doing all their running in these shoes. I have run over 150 miles in the New York Escalante Racer and there is no sign of compression happening in the midsole, which is what you often get from lightweight racing shoes. There is also no excessive wear to the upper. The reality is you may well be able to get a decent training mileage out of them. If you are looking for a fast racing shoe but aren’t used to Zero Drop then it would be best to gradually increase the amount of time you spend in the shoes. Running intervals in the shoes is the perfect way to achieve this. You can warm up in your usual training shoes and then run your short faster work in the Escalante Racers, before warming down in your usual shoes.